This summer, four eager interns descended upon Factual’s office in Los Angeles from around the country, with representation from The University of North Carolina at Chapel Hill, The University of Illinois Urbana-Champaign, Massachusetts Institute of Technology, and University of California, Berkeley. As part of the Factual internship program, each intern proposes and then completes an ‘intern project’ during their time with Factual. Since the Marketing team has been using data insights regularly, I thought it would be interesting to compare insights from Factual’s data to each university’s stereotype. 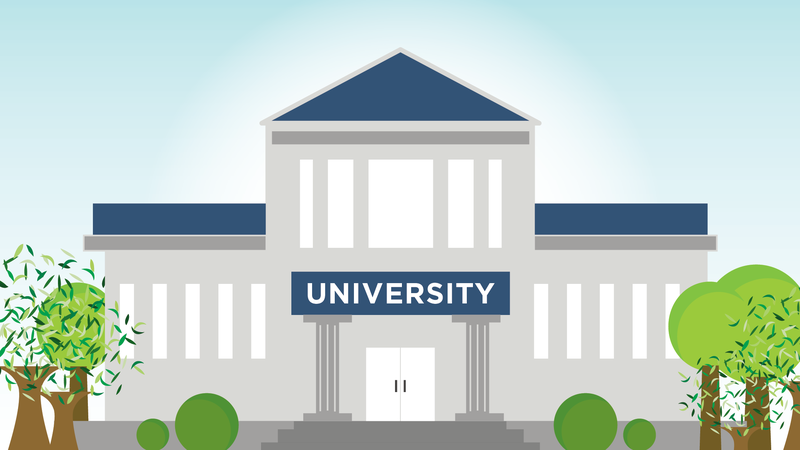 Each university has a different reputation for their student life on campus and we could learn first hand from our interns whether or not the insights were true. First, I looked at what our interns had to say about the repulations of their schools. UNC is the nation’s oldest public university and located in a quintessential college town. The town and university are interwoven together, with most students living off campus. College bars and hipster coffee shops are a staple of the college experience, along with enjoying the outdoor appeal of nearby lakes and running trails. On weekends most students hang out in Chapel Hill and the neighboring town of Carrboro rather than venturing as far as Raleigh or Durham. – Factual Intern Mark W.
At a large public school like UIUC, you can find an array of people and there really isn’t one stereotype that pertains to all students. A big portion of the student body is involved with the greek system, which can sometimes perpetuate the negative stereotype of a heavy party culture. However, this isn’t necessarily true considering the many groups dedicated to professional and community development. Given the limited entertainment available because the school is surrounded by cornfields, many people tend to hang out at the local bars. You’ll also see students shuttling between classes in their North Face jackets or spending time on the Quad. MIT students work hard and are incredibly passionate about whatever it is they do. Many students are more than a little quirky, but not just boring nerds – they love going into Boston, watching performing groups on campus, and building cool stuff. Each year, students play Tetris on the tallest building on campus, build incoming freshmen a fully functional roller coaster, and make batches of liquid nitrogen ice cream. MIT can be a really difficult place, but the amazing, caring people make it all worthwhile. The student population at UC Berkeley is a diverse group with hundreds of subcultures and a wide variety of lifestyles. But most Berkeley students tend to fall under one or two of the stereotypes. We love boba, pizza, and lots of green food. We wear hipster clothes and do weird things to our hair and go to lots of concerts in San Francisco and Oakland. But we also can spend full days in campus libraries. After getting a sense of their backgrounds, I worked with a fellow intern to run an insights report using Factual’s proprietary Global Places and Observation Graph data. We compared devices seen at a high frequency at these colleges and compared them to the general device population over the same period of time. Between unlimited meal plans and stress eating, the “freshman 15” is a dreaded phenomenon that many college students face in their first year. 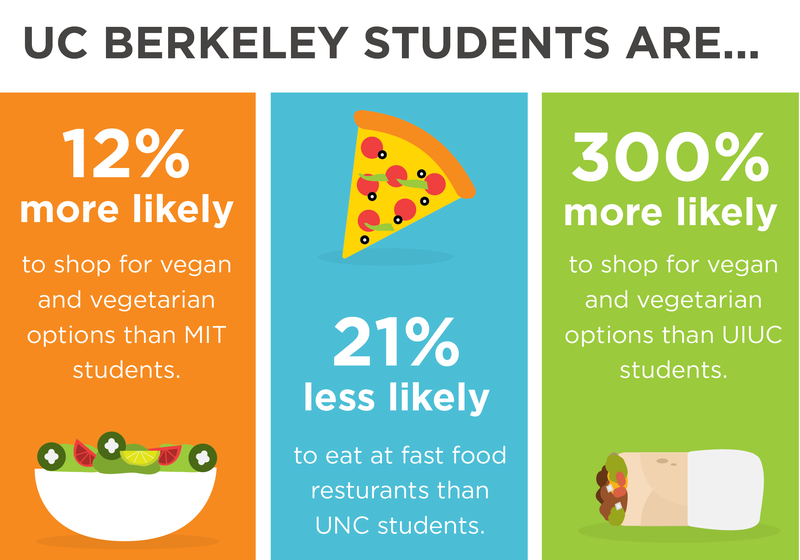 Nevertheless, some college campuses tend to shy away from the overprocessed and greasy quick serve options, for example we saw that UC Berkeley students are more likely to purchase vegetarian or vegan food. Come midterms or finals season, coffee is both a college student’s best friend and worst nightmare. 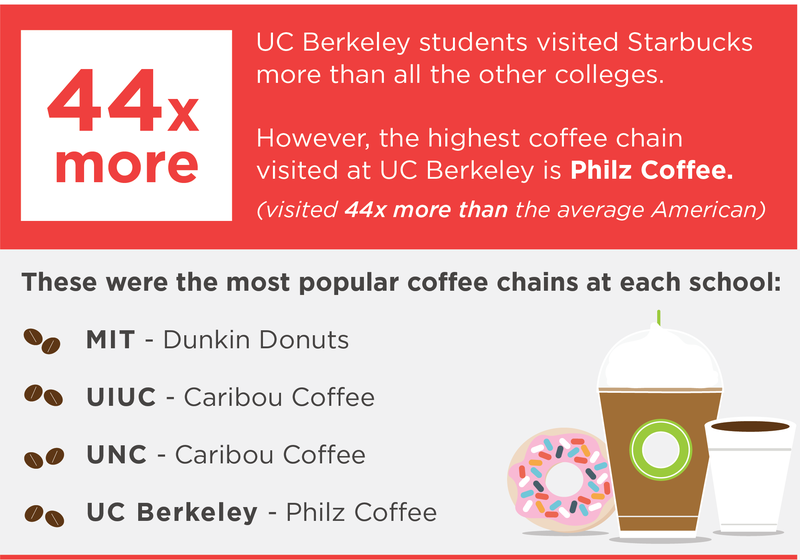 In general, coffee consumption did not vary much and was overall fairly high amongst all the colleges but where the students purchased coffee varied. Surprisingly, Starbucks does not rule all campuses. 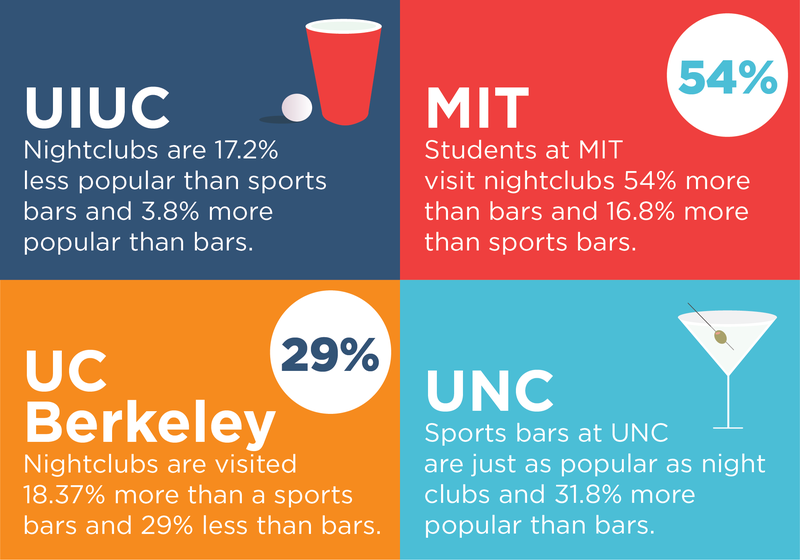 When it comes to the social aspect of college life, Factual data showed that schools in college towns with more prominent athletic teams preferred sports bars over regular bars and nightclubs. But overall, the four schools had similar visit patterns to social establishments. Students at UIUC had the highest visits to social places, followed by MIT, UNC and UC Berkeley. As a Factual intern and advertising student, I’ve seen how incredibly important data is for brands to reach their target customers. This internship proved to be a fantastic learning opportunity in finding out firsthand how advertisers do that. I was able to explore various areas of product marketing including: planning a go-to-market strategy, learning how to introduce a new product to customers, researching ad tech news and articles, and improving my creative skills with Adobe Creative Suite. This summer was a great way to gain hands-on experience in the data and tech industry and I’ll never forget it!